Phil Jones professional woodturner manages Acorn Woodturning Ltd in the heart of Buckinghamshire .He is ideally placed to serve clients in,Bucks,Oxon,Herts and Beds,Northants, and of course London. Phil Jones professional woodturner started wood turning in 1982, serving a six year informal apprenticeship with a family run wood turning business.Which specialised in hand and copy turning of various types. 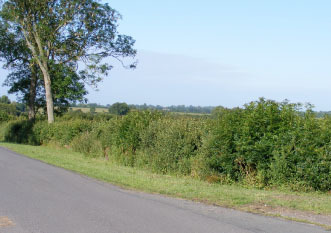 Phil Jones started Acorn Woodturning Ltd in 1988. After a few moves is now based in a work shop in Ford in Bucks. Phil uses his creative skills and experience to produce beautiful hand turned pieces in wood. His favourite native species of wood is Ash, because of it’s natural colours and beauty. Phil also enjoys commissions such as large candles sticks which are both creative ,challenging but very enjoyable. Phil derives immense pleasure in seeing the joy on students faces on completion of their project or of mastering how to turn using the skew chisel or a gouge. Phil has taught woodturning evening classes at the well established and recognised Rycotewood college of woodwork. He was also accepted on to the the register of “The Worshipful company of turners of London” in 2004. 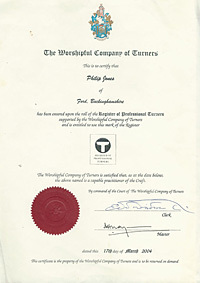 ‘entered upon the roll of the Register of Professional Turners, supported by The Worshipful Company of Turners and is entitled to use the mark of the register‘. A larger version can be seen on our Gallery page in the ‘Teaching’ section. Phil has been turning for many years and here is a short video of Phil hand turning a mould for making a casting. If you have have a tree that you are fellling or prunning, Phil would be pleased to make you a bowl or an apple from it for you as a memory of your tree.